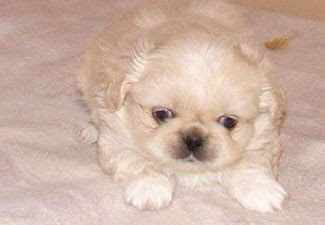 Breed Group: Toy Weight: 6-8kgs Height: 30-32 cms Color(s): golden , black , white Coat: The Pekingese is a double-coat breed. The outer-coat is extravagant, long, and straight flowing with profuse feathering. The under-coat is soft and plush in texture. Distinct feature: they have long and silky fur with miniature size. Eyes and nose are distinctively black. They have punch face. Temperament: The Pekingese is sensitive, loving, and extremely affectionate when they choose to be. They are also stubborn and opinionated. They are generally a one-person pet who is deeply devoted to their master. They make excellent watchdogs. Activity: The Pekingese is able to have the majority of their exercise needs met indoors with play sessions. They make excellent apartment or condominium dwellers.